Tithing is a commandment accepted by various churches in the Latter Day Saint movement in which adherents make willing tithe donations, usually ten percent of their income, to their church. It is based on both the biblical practice of paying tithes and modern revelation given to Joseph Smith and his accepted successors. For many of these churches, the law of tithing replaced or supplemented the law of consecration. The Church of Jesus Christ of Latter-day Saints (LDS Church) emphasized tithing in the 1900s and 1960s to assist in paying church debts. While in Far West, Missouri, Smith received a revelation commanding his followers to build up a holy city Zion and construct another temple. Faced with the future financial burden that this commandment would create, Smith gathered several church leaders on July 8, 1838, and prayed to know how much property God required for tithing. The answer that Smith received is recorded in Doctrine and Covenants, which describes three types of tithing, including "all their surplus property", "all those who gather unto ... Zion shall be tithed", and "one tenth of all their interest annually." The revelation states that the original purpose of the surplus property was "For the building of mine house, and for the laying of the foundation of Zion and for the priesthood, and for the debts of the Presidency of my Church." Additionally, it warned that "if my people observe not this law, to keep it holy... behold, verily I say unto you, it shall not be a land of Zion unto you." After Smith received this revelation on tithing, he assigned Brigham Young to collect the Saints' "surplus property". Smith did not define the phrase "surplus property", instead allowing the people to judge for themselves. In November 1841, the Quorum of the Twelve stated that "surplus property" would mean "one-tenth." Modern scholars disagree on whether this original provision was only applicable under the law of consecration. :53–54 After Joseph Smith's death and the resulting succession crisis, various factions of the Latter Day Saint movement developed their own tithing practices. The LDS Church is the largest branch of the Latter Day Saint movement, with membership estimated at 16.1 million as of December 31, 2017. The LDS Church today teaches that tithing is ten percent of one's annual income. It is left to each member to determine what constitutes "income". The LDS Church entered a debt crisis following the panic of 1893. Lorenzo Snow became the church's president in 1898 and worked to solve the church's money problems. With tithing donations declining, Snow traveled to southern Utah in 1899 and urged members to pay a full tithing. He returned to Salt Lake City and continued preaching its importance to church leaders, causing tithing revenues to increase. Snow's successor in the presidency, Joseph F. Smith, continued his predecessor's emphasis on tithing. The LDS Church paid off all its debts by the end of 1906. In 1908, the First Presidency and the Presiding Bishopric reformed the tithing process by deprecating the use of the church-issued scrip currency and shifting entirely to a cash-based system. The LDS Church uses tithing funds for building and maintaining temples and meetinghouses. It is also used to fund the church's missionary and education efforts. Tithing donations collected within the United States are sent to the LDS Church's headquarters in Salt Lake City. Funds collected outside the United States generally stay within their country of origin to avoid long shipping times and foreign exchange fees. :20 In 2015, the church approved an online method for members in the United States to submit tithes and other offerings. Early church officers were paid from tithing money; the scriptural basis for this practice being, "He who is appointed to administer spiritual things, the same is worthy of his hire" (D&C 70:12). In April 1896, the First Presidency attempted to end salaries for "any one but the Twelve." Today, the LDS Church operates at the local level by an unpaid lay ministry. :20–22 According to Gordon B. Hinckley, church general authorities today are given a "living allowance" taken from the church's business income. Today, the bishop or branch president schedules an annual tithing settlement meeting with each member of his ward or branch. In the interview, church members declare their status as tithepayers, and the leader records this on the church records. The Community of Christ (previously known as the Reorganized Church of Jesus Christ of Latter Day Saints) is the second-largest branch of the Latter Day Saint movement, with membership estimated at 250,000 as of 2008. New converts are expected to prepare an inventory to establish their net worth. Their initial tithing entails a tenth of this net worth, which can be paid at any time. Members then pay their tithing annually, calculated by taking their gross income, subtracting their "basic living needs" and turning over to the church ten percent of the remainder. The Community of Christ defines tithing as "offerings to support local, mission center, and worldwide church ministries." Such offerings may include 10 percent or more of one's income, though poorer members can give any desired amount. ^ Smith, Joseph; Smith, Heman Conoman (1897). History of the Church of Jesus Christ of Latter Day Saints. Board of Publication of the Reorganized Church of Jesus Christ of Latter Day Saints. p. 529. ^ a b c d Harper, Steven C. (January 13, 2016). "'The Tithing of My People' D&C 119–20". Revelations in Context. LDS Church. Retrieved March 20, 2016. ^ a b c d e Quinn, D. Michael (June 1996). "LDS Church Finances from the 1830s to the 1990s" (PDF). Sunstone: 17–26. ^ The revelation is found in section 119 in the LDS Church edition of the Doctrine and Covenants, section 106 in the Community of Christ edition, and section 107 in the 1844 Nauvoo edition. ^ a b Smith, Joseph (2015). "Section 119". Doctrine and Covenants. ^ a b c d Bell, E. Jay (1994). "The Windows of Heaven Revisited: The 1899 Tithing Reformation". Journal of Mormon History. Mormon History Association, University of Illinois Press. 20 (1): 53–54. JSTOR 23286314. ^ "LDS Statistics and Church Facts". www.mormonnewsroom.org. ^ "How is tithing calculated?". FairMormon. Retrieved March 13, 2016. ^ Brunn, Stanley D. (February 3, 2015). The Changing World Religion Map: Sacred Places, Identities, Practices and Politics. Springer. pp. 1213–5. ISBN 978-94-017-9376-6. ^ a b c Arrington, Leonard J. (1993). Great Basin Kingdom: An Economic History of the Latter-day Saints, 1830-1900. Salt Lake City: University of Utah Press. ISBN 9780874804201. ^ Rogers-Iversen, Kristen (September 2, 2007). "Utah settlers' black slaves caught in 'new wilderness'". The Salt Lake Tribune. ^ Williams, Don B. (December 1, 2004). Slavery in Utah Territory: 1847-1865. p. 52. ISBN 9780974607627. ^ Horne, Dennis B. (2014). "Reexamining Lorenzo Snow's 1899 Tithing Revelation". Mormon Historical Studies. 14 (2): 143–152. ^ "Moving Forward into the New Century". Church History In The Fulness Of Times Student Manual. LDS Church. pp. 481–494. Retrieved September 9, 2016. ^ Alexander, Thomas G. (1996). Mormonism in Transition: A History of the Latter-Day Saints, 1890-1930. University of Illinois Press. pp. 100–101. ISBN 978-0-252-06578-1. ^ Wilson, Thomas Frederick (1992). The Power "to Coin" Money: The Exercise of Monetary Powers by the Congress. M.E. Sharpe. p. 167. ISBN 978-0-87332-795-4. ^ Walch, Tad. "Online system will allow Mormons to pay tithing, donations and mission contributions digitally". deseretnews.com. Deseret News. Retrieved March 4, 2019. ^ "Tithing". Gospel Topics. LDS Church. 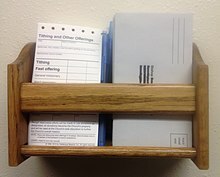 ^ "Church Approves Electronic Method to Submit Tithing and Other Donations". Mormon Newsroom. April 29, 2015. Retrieved March 7, 2016. ^ Hinckley, Gordon B. (October 1985). "Questions and Answers". Retrieved March 20, 2016. ^ "Tithing settlement". LDSTech. LDS Church. Retrieved March 13, 2016. ^ Kimball, Edward L. (1998). "The History of LDS Temple Admission Standards". 24 (1): 135–176. JSTOR 23287671. ^ Bohn, Robert F. (January – February 1984). "A Modern Look at Tithable Income" (PDF). Sunstone (43): 16–24. ^ "Tithing". Community of Christ. Retrieved March 13, 2016. ^ Smith, Jason (2010). "Divergent Churches". In Reeve, W. Paul; Parshall, Ardis E. (eds.). Mormonism: A Historical Encyclopedia. ABC-CLIO. p. 236. ISBN 978-1-59884-107-7. ^ a b Fletcher, Rupert J.; Fletcher, Daisy Whiting (1973). Alpheus Cutler and the Church of Jesus Christ. Independence, MO: Church of Jesus Christ. OCLC 902590. ^ a b Walker, Ronald Warren (January 1998). Wayward Saints: The Godbeites and Brigham Young. University of Illinois Press. ISBN 978-0-252-06705-1. Dahl, Gordon B.; Ransom, Michael R. (September 1999). "Does Where You Stand Depend on Where You Sit? Tithing Donations and Self-Serving Beliefs". The American Economic Review. American Economic Association. 89 (4): 703–727. JSTOR 117156.